This new queen size cooling gel pressure relief mattress is the latest breakthrough in pressure prevention. Now available in 54" and 60" Widths. This new ground-breaking support surface provides optimized pressure redistribution, rapid heat dissipation, and vast increases in breathability compared to standard pressure prevention mattresses. How does it work?? The new visco foam infuses gel pockets into the foam. This new technology was adapted by the Temper Pedic mattresses. This works by allowing air to pass through open cells in the foam while channeling it away from the body instead of trapping it within the closed cells of traditional memory foam. The infusion of gel polymers throughout the foam contributes both cooling properties and the virtual elimination of static fatigue. This new cooling gel and foam combination holds it shape much better and redistributes pressure over a wider surface area. This removes painful pressure points from the patient as they sleep. 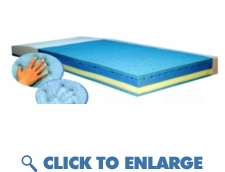 The new gel memory foam technology is much cooler than traditional memory foam products. It transfers heat away from the body leaving the patient cool and dry. The new heel slope feature utilizes a 25 degree slope at the foot area of the mattress. This slope redistributes pressure from the vulnerable calf and heel area. This special heel zone is is plush and aerated, keeping skin cool and dry. This cooling gel pressure relief mattress is designed for a twin sized box spring or a standard medical bed frame. The cover is microbial and is fluid proof, low shear, removable and washable. Special sloped zone to reduce pressure on the calf and heel area. Superior pressure redistribution achieved by providing more support and less cradling at higher levels of compression, distributing pressure over a much larger surface area.